Drinks All Around!. YAY! 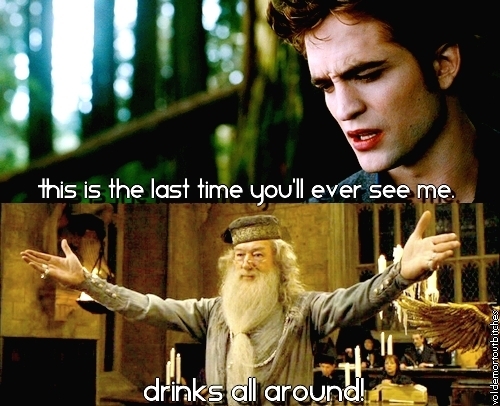 *passes butterbeer out*. Wallpaper and background images in the 해리 포터 대 트와일라잇 club tagged: harry potter dumbledore edward cullen. This was soooooo funny! AHAHHAHAH!!!!! Firewisky for all on the most joyous occasion! To our sad loss of the glittering creeper...DRINK UP! i love it!!!!!! savor the moment peeps!!! pass me the Odgen's best! i wanna get drunk and remeber this joyous moment forever! !